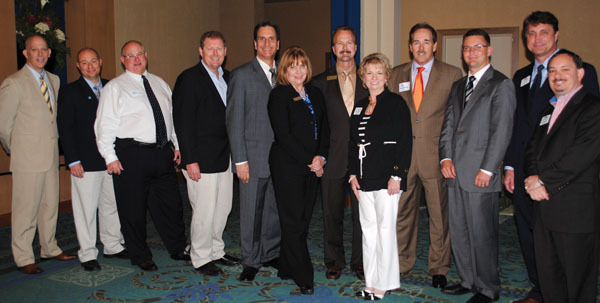 Participants in the 8th annual State of the Bay Tourism Address included, from left, South Shore Harbour Resort General Manager Roy Green, Kemah City Administrator Rick Beverlin, Kemah Mayor Bob Cummins, Galveston County Commissioner Ken Clark, Clear Lake Area Chamber Chairman Mike Furin, Convention and Visitors Bureau President Pam Summers, League City Mayor Tim Paulissen, Clear Lake Chamber President Cindy Harreld, Nassau Bay Mayor Mark Denman, Harris County Commissioner Jack Morman, Seabrook Mayor Glenn Royal and Mike Giangrosso, chairman of Bay Area CVB and Seabrook city councilman. The state of the lake is quite good, and will only get better and better with the opening of the Space Center Houston space shuttle and when the expansion of State Highway 146 is complete. That was the consensus from area officials who spoke at the 8th annual State of the Lake Tourism Address hosted at South Shore Harbour Resort by the Clear Lake Area Chamber, South Shore Harbour and the Bay Area Houston Convention and Visitors Bureau. Both Harris County Commissioner Jack Morman and Galveston County Commissioner Ken Clark were among those introduced, along with Mayors Glenn Royal of Seabrook, Louis Rigby of La Porte, Tim Paulissen of League City, Mark Denman of Nassau Bay and Bob Cummins of Kemah, plus Kemah City Administrator Rick Beverlin. Commissioner Morman agreed. “We’re making real progress by working together. I expect work to start in three to four years,” he said, going on to tell the crowd how Sylvan Beach is being revitalized and a new boardwalk is being installed at Armand Bayou Nature Center. Space Center Houston President Richard Allen topped off an afternoon of good news with the announcement that NASA was donating the Boeing 747 that ferried all the space shuttles around the country to the visitor center, which will display its full-size space shuttle mockup atop the historic jumbo jetliner. La Porte actually began as a tourist town back in 1892, Mayor Louis Rigby told the crowd. Nassau Bay property values have zoomed to $75 million with construction of Nassau Bay Town Square, Mayor Mark Denman said. League City is seeing no let up in its growth with 377 new homes being built this quarter, Mayor Tim Paulissen reported.